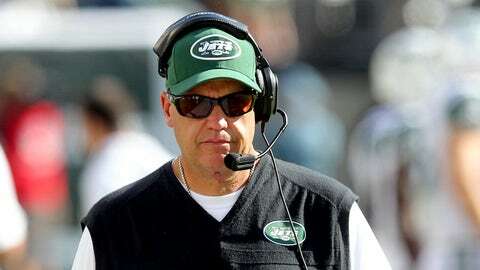 Despite the Jets' underachieving season, coach Rex Ryan believes he should return to lead the team next year. The New York Jets were mathematically eliminated from playoff contention with the Ravens’ win over the Lions Monday night, officially kicking of the start of Rex-Ryan-trying-to-save-his-job season in the NFL. The Jets, 6-10 finishers last season, are 6-8 this year with games against the Browns and Dolphins remaining. They’ve been hampered, yet again, by inconsistent quarterback play and a defense that has failed to meet the standard set during back-to-back AFC championship appearances during Ryan’s first two years with the team. Ryan has never exactly been one to let a thing like reality harsh his mellow, so it comes as no surprise that he’s confident in his abilities to lead the Jets to the promised land. But after a third straight season at or below .500, one has to figure owner Woody Johnson’s patience is running thin. However, even if his firing seems inevitable, Ryan has made it clear he will go down swinging. “I’m a competent guy, even though I know that’ll be questioned a zillion times forward and backward,” Ryan said. “That’s fine. But I know I’m a good football coach. I believe in this team. I believe in this organization. And I’m determined to bring a winner to this team. There’s no question about it. And I believe that I’m the right guy for it. I’m not the guy making that decision. If I was, it would be easy. • Is Santa Claus cursing the Mets? • Josh Sitton is ready for a zombie apocalypse. • A Middle Tennessee State wide receiver has been charged with shoplifting a $30 phone charger. • Shane Battier bought Chris Bosh a telescope for Christmas. • Carmelo Anthony has Mike Woodson’s back despite the Knicks’ struggles. • Not everyone in the Lakers’ locker room is experiencing much holiday cheer. • Yet another associate of Aaron Hernandez’s has died. • Wade Phillips puts penalized Texans players in time out at practice. • Two Texas schools are canceling classes for the state championship football game. #CuseTixforKids Update: 24 hours ago we set a goal of $12K. Currently at $25,426.69. Give or take, that's 800 kids to the @TexasBowl.